Attendees take part in Wednesday, Feb. 1’s health and safety panel during CanWEA’s 2017 Operations and Maintenance Summit in Toronto, Ontario. 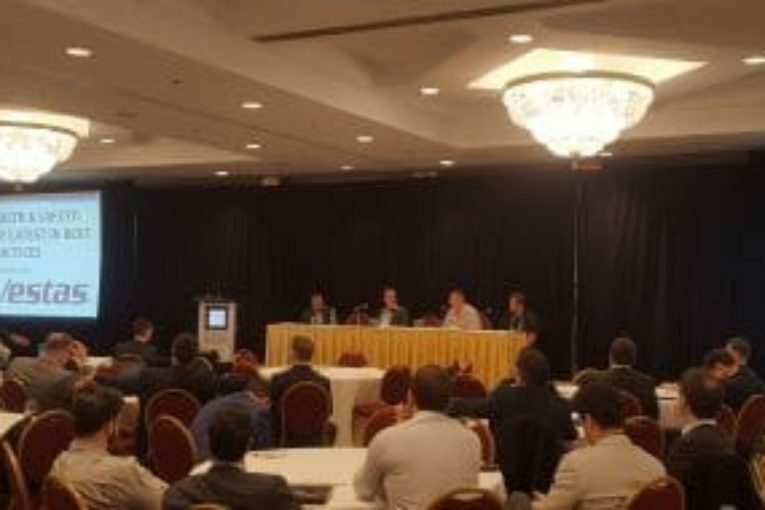 The panel consisted of, from left, Vestas America’s Sr. Director – Eastern Service Region Shaun Melander, ENERCON Services Canada’s Managing Director Dan Barker, Acciona Wind Energy Canada’s Director of Safety Karl DeLooff, and Scott Connor, Chief Training Officer with Team-1 Academy Inc. The 3rd annual Canadian Wind Energy Association (CanWEA) Operations and Maintenance (O&M) Summit has come to a close. At 210 participants, it was our most well attended O&M Summit to date with more exhibitors and poster presenters than we’ve ever hosted before. Collectively, the list of delegates has their hand in nearly all of Canada’s wind energy capacity. As anticipated, the two-day event was a success and not only because of the numbers. In sharing a few of the main themes that surfaced during the event I will point to several opportunities and areas of action for the industry and CanWEA. I expected to be writing more about challenges and opportunities with big technology advances. Possibly identifying equipment or processes that will make life easier on everyone. While we did see great presentations on technology advances with lighter harnesses, gearbox repairs and vehicle fleet tracking the conversations often came back to a few things that are less tangible. Collaboration. I don’t want it to sound like this hasn’t been thought of or put into practice before. What I want to point out is that there is a significant appetite for all parties in the wind O&M sector to work together and find a balance that is beneficial for everyone. Our opening panel on the second day of the summit focused on the part each turbine manufacturer, owner and independent service provider has to play in keeping a wind farm operational. While some exclusive strengths were emphasized for each group, there was very little talk of any one of them being unnecessary in maintaining the fleet. It is evident that everyone has a seat at the table and a perfect balance is site-specific. Of interest is that during one of the live polls the audience identified a gap in the independent service market; an opportunity that is waiting to be filled. Relationships and Trust. There were many examples of an applied technique that was presented and its success all seemed to hinge on the ability of the parties involved to trust each other. This again is not unique to the wind industry. What is new, however, is that the trust is growing. It was mentioned to me, a few times, by some of the long-time industry professionals that even just a few years ago most people held their cards quite close and watched their partners even closer. Based on the open dialogue and the freedom with which our presenters and panelists shared knowledge the contrast is obvious. As the experience base of the Canadian wind industry grows (both in population and in years) you can count on more open discussion which can only lead to more options for the ones willing to reach out. On top of the good content that the industry brought to the table for delegates we also saw a great deal of networking taking place! This is all very encouraging to the CanWEA team as it highlights that there is still room to grow and develop this very important event. The CanWEA staff also did what they could to progress the conference by leaning heavily on the mobile app to provide live polling opportunities, feedback surveys as well as a 75-minute session driven entirely by audience participation – “voting-up” questions that were most important to them. As I noted in my blog leading up to the Summit, this event is well positioned to drive the industry forward. I also commented that if we’re repeating ourselves in 2018 then we’ve missed this opportunity to make progress. In my role, I have the pleasure of working with a wide range of people who come from a very diverse set of backgrounds and locations. Some people are working towards finding their niche and making their mark in a way that suits their context and rightly so. But the ones who stand out as leaders after an event like this are those who can distill this wealth of information into clear, achievable goals that they can set their minds to. It is now my job to keep an ear to the ground and listen to those leaders as they share and implement the strategies required to move us through the next steps. These objectives may vary from person to person but sooner or later some of these will align and that’s the point of action. It is these collective goals that CanWEA will be working to document and deploy so that in a year’s time we can look back at what was accomplished and use it to fuel yet another year of remarkable progress.